Fantastic! 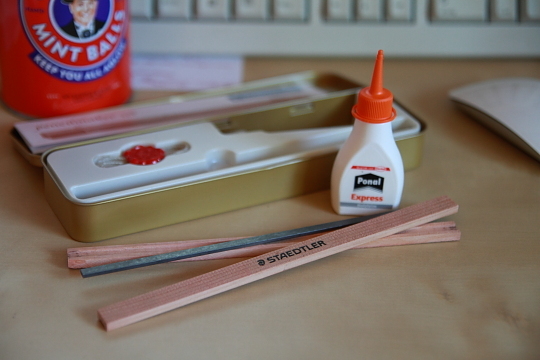 This morning I received my historic pencilmaker set. The tin is labelled in eight different languages, even though you can only order this set directly from Staedtler in Germany. Stocks are limited, Staedtler does ship overseas, so if you want you please hurry before they are gone. The price is € 5 per set, one set makes one pencil. Is the “wax” seal a sticker? Very nice. Now all you need is a parchment scroll! How cool! I’ll have to check this out. He he – Uncle Joe’s Mint Balls. I once spent hours drawing this tin as part of an art course on coloured pencil techniques. you did so not want to know that. Stationery Traffic, that would be nice! I’d really like to try this pencil, once assembled, on some sort of old-style paper/parchment. Michael, I am happy you recognised them (and I did want to know – and your comment is even is pencil related). I put them in the photo on purpose, just because they do look a bit “old” as well, even though not nearly as old as the pencil.. I didn’t know you could get them in the South – or was that long ago? I thought (at least these days) they were a local thing in the North… Even near Wigan, where they are made, many supermarkets stopped stocking them, they are now nearly as difficult to get as Altoids.. That’s the strange thing about British sweets: you get more varieties of Fisherman’s Friends in Germany and China than in Lancashire, where they are from. Another example: I found Altoids in a small supermarket in Franconia (but to be fair, they are actually not really common in Germany), even though I struggle getting them near Preston. I believe they are popular in the USA… Many of these British sweets are more common and popular outside the UK..
Sean, the seal is not a sticker but made from extruded plastic and has to be attached with the supplied glue. I would like to add that in Staedtler’s historical pencil workshop that can be seen on many occasions (like at the Paperworld) that pencil is made too, albeit with a real wax seal. And on the topic of this post, this kit is really awesome. What an adorable stocking stuffer this would make… wow, it’s Easter and I’m already thinking of Christmas. There’s something wrong with that.